I'm not sure what I like most about this salad... the creamy diced avocadoes, the tang of the crumbled blue cheese, the crunch of the crumbled bacon, the subtle sweetness of ripe tomatoes or the homemade ranch dressing. Regardless, together they are outstanding as a cobb salad. I've had difficulty finding a ranch dressing recipe that's spot on, but the recipe I found from Cook's Illustrated nails it on the head. I won't be buying ranch dressing from a bottle any more! The original recipe included bits of red bell pepper, however I omitted it and it was still perfect. 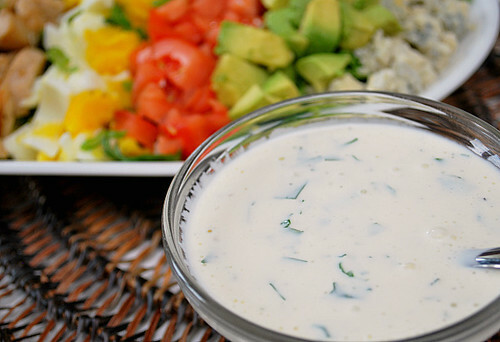 This ranch dressing recipe can be altered to use as a thick dip by omitting the buttermilk and doubling the amount of sour cream. Place the shredded lettuce on the bottom of your serving platter. Place each of the remaining ingredients in a row on top of the lettuce except for the green onions. 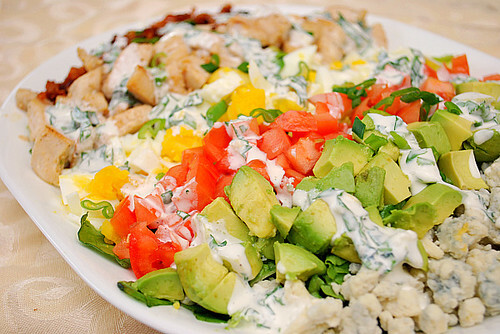 Drizzle the top of the salad with ranch dressing (recipe below), then toss to combine and serve immediately. Combine the minced garlic and salt and work together to create a smooth paste. 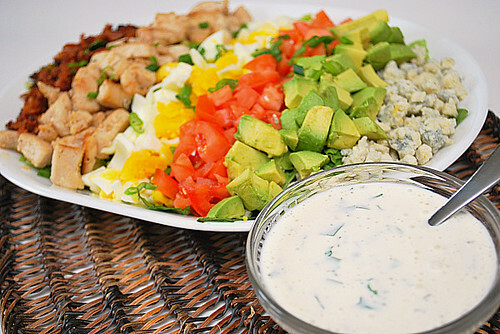 OH, this salad looks amazing as well as the ranch dressing. Yummmmm. I love good Ranch dressing and this sounds fantastic.